The Centers for Medicare and Medicaid Services (CMS) requires a health risk assessment to be included in the Annual Wellness Visit. The purpose of the Medicare health assessment is to identify heath needs and risk factors so beneficiaries can be directed to appropriate care, ultimately improving outcomes and reducing costs. ConXus Profile for Medicare is NCQA WHP 5 and HITRUST Certified and meets the CDC’s framework. 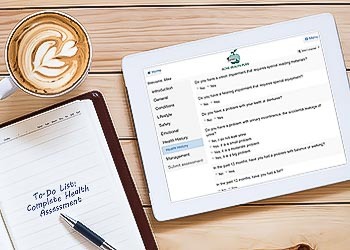 The health assessment questionnaire may be completed online from a PC, tablet, or smartphone, on paper using scannable bubble forms, or by a health navigator. The actionable member report is available online and for batch printing and delivery by mail. A provider report summary is available online for the member to print and take to their next visit. The provider summary is also available for batch printing and delivery by mail, and in XML or PDF format for integration into your EMR. Comprehensive reports and data extracts provide all the information required to drive population health programs and measure outcomes. PDHI offers a range of tools and services to facilitate health assessment completion. Our flexible delivery model allows you to use internal resources, outsource to PDHI as a delegated activity, or combine internal and external resources. ConXus Profile Health Assessment is also available for commercial and Medicaid (adult and pediatric) populations.